Wanted: corpses. Apply to Doctor Robert Knox, MD, FRSCEd, Professor of Medical Studies, Barclay’s Medical College, Surgeon’s Square, Edinburgh. Reference William Burke, hanged Jan. 28, 1829. Robert Knox was a noted physician in his prime, in the early 1800s. A surgeon, anatomist, and zoologist, Knox studied anatomy in London, then headed off to Africa in the army. Field surgery was a brutal business, and the poor anatomical knowledge at the time made it even more terrifying for those involved. In 1821, Knox moved to France to work in the shadow of his heroes, Georges Cuvier and Étienne Geoffroy Saint-Hilaire; a year later, he was back in Edinburgh, making himself a career academic. When his old professor came calling in 1826 with an opportunity to teach at Surgeon’s Square in Edinburgh, Knox jumped at the chance. As a partner to Barclay and curator of the school’s museum, Knox was well aware of the significant problem that faced the school: corpses were hard to come by. And since the Royal College of Surgeons at Edinburgh certified the school as a prep course for entrance to University, coming up with bodies became a very important task. If there’s one way to ruin your career, it’s to be caught paying a few pounds for fresh murder victims. So it was for Knox, who gave out 7 pounds, 10 shillings for the body of an itinerant lodger who died in William Burke’s building in 1827. This transaction led Burke to realize that such lodgers weren’t paying as much alive as dead. As a collector of bodies, Knox also had a strict no-questions-asked policy, and Burke and his partner William Hare exploited that to its fullest extent. Almost a score of suspicious bodies later (and after the price had inflated to 10 pounds per), the pair was found out, given away as suspects by the lame and mentally disabled “Daft Jamie” Wilson, then caught when the late Marjory Campbell Docherty was found by a fellow tenant under one of Burke’s lodge’s beds. Hare copped to a string of murders* and played stool pigeon in exchange for a lighter sentence. As a corpse himself, Burke made one final contribution to science’s insatiable desire for bodies: his cadaver went straight from the gallows to the practiced hands of one Dr Alexander Monro, who performed a complete lecture while dissecting the murderer’s corpse. Lecture complete, the good doctor opened the doors to all comers to gaze upon the body, and tens of thousands of Scots obliged. 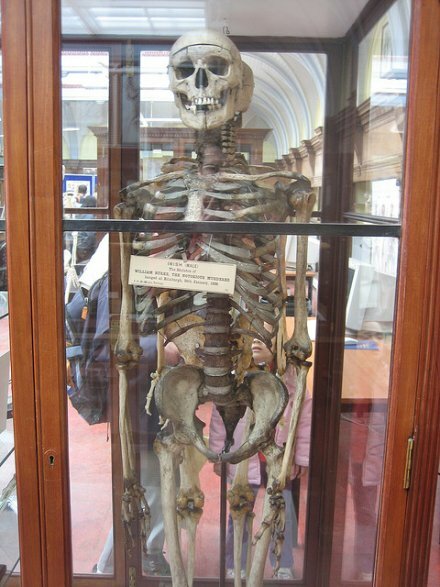 Burke’s skeleton remains on exhibit at University of Edinburgh medical college, and, as was the style at the time, his skin was used to make a pocket book now on display at the Surgeons’ School there. Knox, for his part, paid not with his neck but with his reputation. Though never charged with a crime, the doctor was run out of the the lecturing business, first by subtle and not-so-subtle actions by the University, and eventually by the passage of the Anatomy Act of 1832. He was also unable to obtain any surgical post after the incident and spent his later years writing academic books and papers, none of which have lasted like the doggerel that shadowed his steps. Knox, the boy who buys the beef. 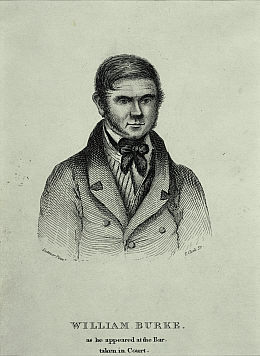 Robert Knox was operating under the Murder Act of 1751, which expressly forbade the burial of an executed murderer while permitting the malefactor’s dissection. The Act had the dual effect of allowing the state to gibbet executed criminals (both hanging in chains and dissection were considered an added ignominy, beyond the punishment of the gallows), and of supplying the budding medical community with an immediate source of fresh bodies. 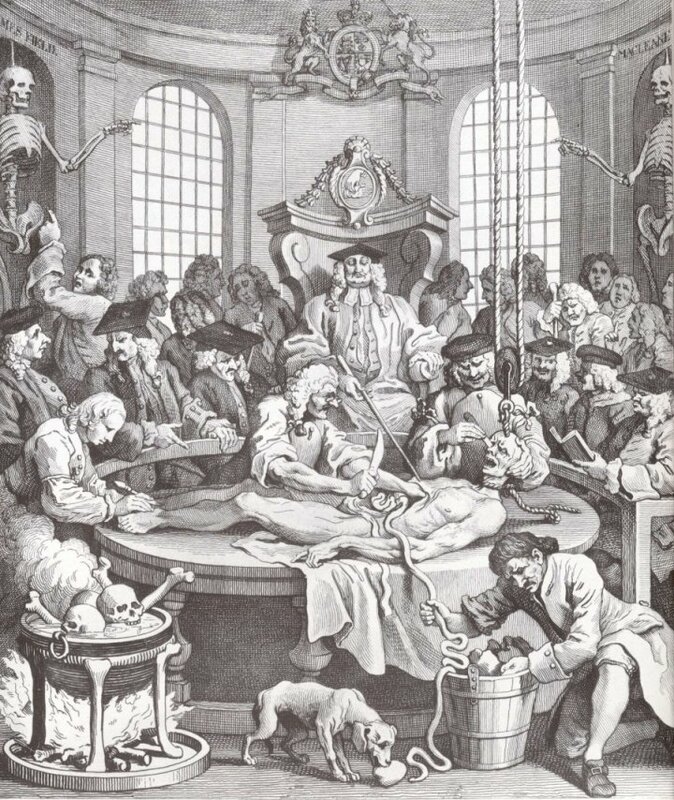 As courses in anatomy became more commonplace, though, the need for cadavers increased dramatically, and the business of selling bodies for science was born. Typically, these sales manifested themselves in body-snatching — wherein “resurrectionists” illicitly exhumed a freshly buried corpse and conveyed it to some physician’s ready scalpel. This grim trade in turn spawned a variety of security measures. The favored dead were defended by fences, watchtowers, and human lookouts. But nothing could eliminate the industry. In particular, those with little money or no immediate relatives were unlikely to be buried in these gated graves; that left their remains ripe for the remaindering. As well, the increase in demand made so-called anatomy murder a possibility. Burke and Hare may have been notorious for the offense,** but they did not invent it. As detailed by George Mac Gregor in The history of Burke and Hare and of the resurrectionist times: a fragment from the criminal annals of Scotland, the first known case of anatomy murder occurred in 1752, also in Edinburgh. In that case, two nurses (Jean Waldie and Helen Torrence) on death watch bartered a decent price of two shillings to sell the body of an ill child to a local surgical college. His death was delayed, and the nurses smothered him, possibly through simple carelessness. Agents representing surgeons would bargain with condemned prisoners not under sentence of dissection (remember this only happened for murder: hanging was in vogue for stealing a sheep or even a loaf): occasionally prisoners struck a bargain to pay expenses, to provide for a family or to buy the customary decent apparel for the hanging. Supply was unreliable, however: riots at public hangings became common, partly because of the paltry nature of hanging events, partly from superstition. The body was often reclaimed by relatives and the unpopular anatomists stoned, defeated and out of pocket. Competition was often so fierce that a rival anatomy school carried off the body. Dissection was unpopular and other medical uses were to be found for a recently hung body – the cure of scofula, goitre, wens, ulcers, bleeding tumours, cancers and withered limbs for example. To prevent riots and disorder the Sheriff of London took all bodies of hanged men, except those sentenced to dissection, into his own custody and handed them to the relatives for burial. Hanoverian Britain sure did keep the gallows busy. But the pace of hangings had abated by the 19th century just as demand boomed. The math didn’t add up. Anatomy schools (officially) dissected some 592 corpses in 1825; at the time of the Burke and Hare murders, only about 50 executions were carried out annually, and each college was guaranteed just one a year. That meant a shortfall of close to 550 bodies. With limited supply and significant demand, surgical colleges and anatomical lecturers were willing to pay top dollar for new cadavers … and the anatomical murder business really got legs. This was particularly true in Edinburgh, which boasted an internationally known medical college. Burke and Hare? Just call them entrepreneurs. And while the execution of Burke was met with applause from the community, in London, another group was already hard at work both body snatching and murdering its way into the classroom. Williams and Bishop were just two of a group of resurrectionists known collectively as the London Burkers, who claimed to have stolen upwards of 1,000 bodies from nearby cemeteries. That made the Burkers the largest known exploiters of the anatomical trade. 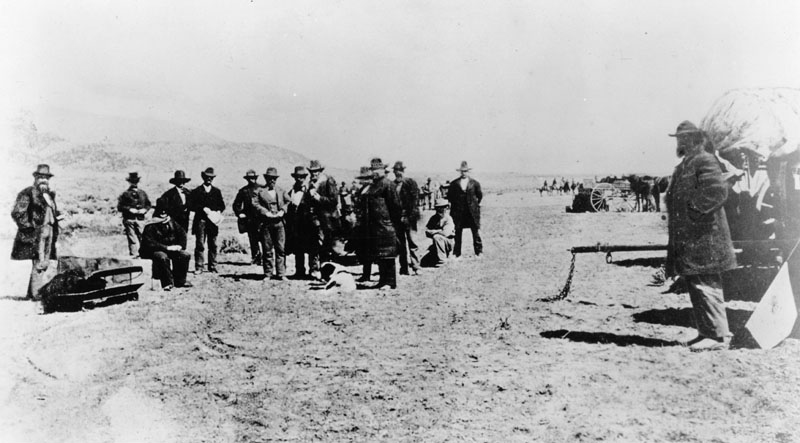 Over the decades after the Murder Act, though, resurrectionists were walking a dangerous line in their communities. Reverence for the dead sparked community outrage when graves were found empty or disturbed, and it was often the anatomists themselves who felt the wrath of crowds.§§ In Glasgow in 1803, surgeons were threatened by an unruly mob and were forced to seek police protection; in 1813, an empty grave caused a similar furor. Punishments moved from fines to jail time as the surging demand made body-snatching an ever more lucrative trade. By the time of the Burkers, anatomists were generally presumed to be body thieves in some capacity, a hostile sentiment graphically underscored during the Aberdeen riots of 1831. When a dog unearthed what looked like a human bone behind the Aberdeen surgical college, a mob coalesced and stormed the lecture hall. The lecturer (“Dr Moir” — little else is known about the man) fled in terror as the hall was burned to the ground. Soldiers and police clashed with the crowd, which was thought to be over 10,000 strong. Hours later, the riot subsided, but Aberdeen was no longer a friendly place for a prospective medical talent. And where Burke and Hare were still not quite sufficient to convince the House of Lords to take up a measure providing anatomists with alternatives for corpse acquisition, the Burkers and the Aberdeen riots apparently were. The underground economy of resurrectionists was supplanted by the Anatomy Act of 1832, which allowed individuals to donate themselves or their unwilled kin to science for a pittance of compensation. * The murders included at least one husband/wife pair, a mother and, later, her (adult) daughter, and a grandmother and her young grandson. They are also known as the West Port Murders. ** Burke entered the English language as a verb meaning … well, pretty much exactly what Burke got up to. And the rest of the rascals jumped on him and burked him. † 9 pounds, 9 shillings; by the time of the transactions, the guinea was no longer technically in use, but the term had stuck at the 21-shilling mark. ‡ Over the course of their 6 active months, the pair went from asking 8 guineas to asking 12 guineas; apparently 9 was the negotiated price with St Bartholemew’s. §§ Edinburgh also had trouble as far back as 1742, when several surgeons’ homes were attacked by locals; a local beadle suspected of the crimes also had his home, dubbed resurrectionist hall, burned during the mob incident. The condemned — those their fellows have marked for deliberate elimination — have always had a place as our emissaries into the darkness of that final, mysterious passage. We gaze through that dead man walking — a ferocious criminal once upon a time, maybe, but now pinioned and defenseless, meat for sacrificial theater — we gaze through him into the abyss, and the abyss gazes also into us. He does not merely confront us with our mortality, but with our still more terrifying duality. Awaiting the chop, his self has already been sundered from a corporeal form now appropriated — even by mere chance — to the edification of some foreign entity’s own purposes. “The Reward of Cruelty,” the last plate of William Hogarth‘s Four Stages of Cruelty, depicts the cycle’s subject dissected in an anatomical theater (pdf) following hanging (note the noose) at Tyburn. The operation of the apparatus upon his form is his concern, the account he will make of himself on that stage (Henry VIII’s adulterous fifth wife, Catherine Howard, asked for the headsman’s block in her cell so she could practice how best to address it); the disposal of his flesh, yet living, may be reckoned in thus-and-such many hours. It was once not so rare to travel to the killing scene upon one’s very coffin — in fact, this was recent enough to be photographed. And more to the point, all this is our concern, we scaffold-ministers, for the doomed. Everyone must grapple with the mysterious inevitability of death, but to be reduced to a cadaver while yet alive — that is a special form of horror. No wonder the undead make such spellbinding literature. To another epoch, the line could as well blur in the other direction, the deceased remains be made to suffer for their former soul’s transgressions. Charles II could not best Oliver Cromwell in life, but finally made Cromwell’s bones suffer for regicide. As an object lesson, what difference whether the bones came to the halter breathing or no? 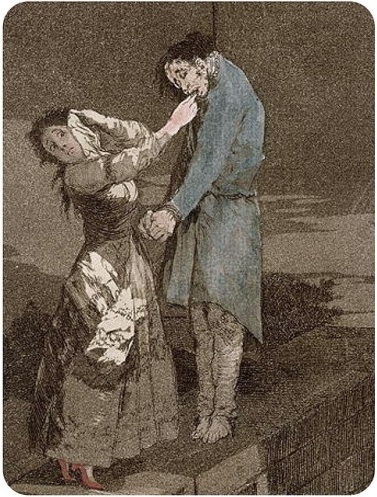 This Goya sketch, “Out Hunting For Teeth”, finds a woman prying out the dead criminal’s teeth for use as dentures. In time that social machine evolved uses of tissue and fluid beyond bloodbath spectacle. In the 18th and 19th century, Foucault contends, the “medical gaze” — a searching, scientific inquiry into the true foundations of bodily decay by following Bichat’s counsel to rip away the exterior and investigate the true form within. This is the literal definition and intent of autopsy: to see with one’s own eyes. The medical gaze, “that absolute eye that cadaverizes life,” is likewise in Foucault’s reckoning a piece of the intellectual and ideological program that made the post-Enlightenment world. 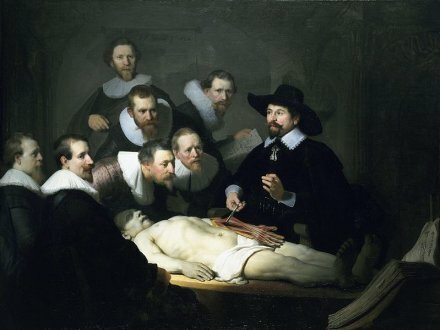 Rembrandt’s The Anatomy Lesson of Dr. Nicolaes Tulp (1632), whose subject was a prosperous surgeon later to become mayor of Amsterdam. The anatomized man is robber Aris Kindt, who had been executed earlier that same day. No surprise that this revolutionary social machine found grist for its mill — commodified corpse-objects, the workers most literally alienated from their produce — at the foot of the scaffold. That which hides and envelops, the curtain of night over truth, is, paradoxically, life; and death, on the contrary, opens up to the light of day the black coffer of the body: obscure life, limpid death, the oldest imaginary values of the Western world are crossed here in a strange misconstruction that is the very meaning of pathological anatomy. Herewith, four who expired to open up their living fellows’ shambling carrion to that life-breathing medical gaze. Highly recommended additional reading: Jai Virdi’s “The Criminalized Body” series: I, II, III, IV, V.